Fusion Flowers is a bi-monthly magazine that shows readers how to create amazing designs in step-by-step format with explanations and instructions from our world-class teachers. 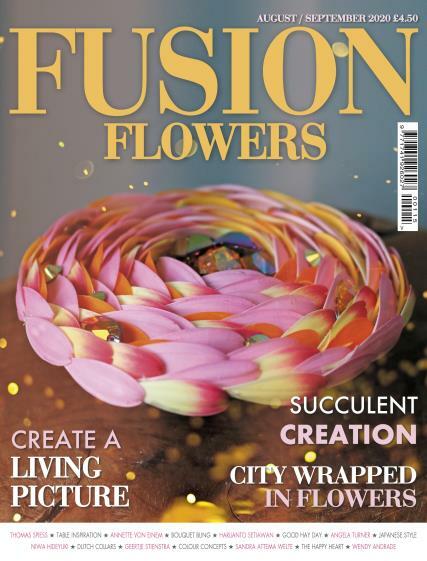 Buy a single copy or subscription to Fusion Flowers magazine. Issue 101 of Fusion Flowers magazine reports from IPM Essen on the Floral Fundamentals Family demonstration when 5 designers revealed the diversity of their styles of work and their personalities too. It proved to be a great success and one that earned the team a well-deserved standing ovation! Just along from the demonstration theatre at Essen is an area where German Master Schools show student's work but this year there was also an interactive area - we report. The annual floral design competitions at Huis ten Bosch in Japan always produce some exciting results and last year was no exception. The quality of the designs was superb and we marvel at curtains fashioned from Dandelion seed heads! WOW! A first for Fusion Flowers is our story about a young Chinese woman's decision to leave the world of high finance to open her dream florist/restaurant! A group of designers were blown away not only with the food but the presentation and the wonderful floristry too. Keita Kawasaki is an internationally renowned teacher, author, judge and designer who has always adopted a contemporary approach to his work. We report on his remarkable latest project. Of course we have lots of step-by-step designs to inspire you including some great ideas for Easter and several arrangements using garden flowers too!